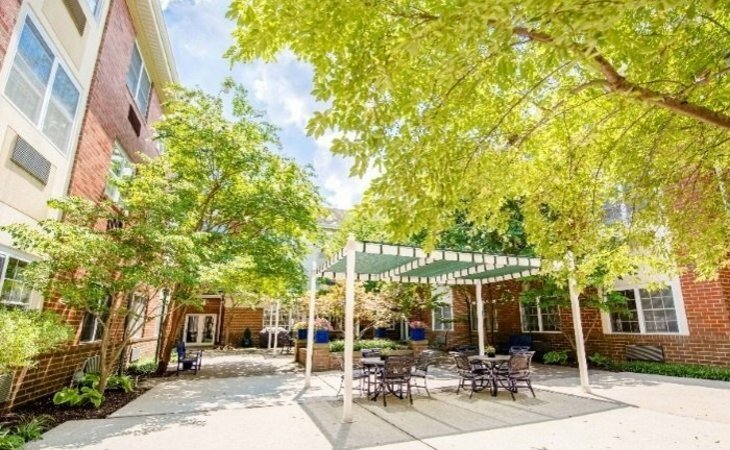 Arbor Terrace of Lanham is beautiful, very nice, and has good facilities. I noticed that they have the folks engaged in crafts, and also have activities and outings for them. One thing that is kind of neat is that they have a veteran's corner, and my father-in-law is very proud of his service. They can put up pictures in that corner. It's really neat and a point of pride that could also spark some competition. They also offer assisted living and memory care and have little birds in a little aviary in a small area where the residents can sit and watch the birds. The only thing is that it's very expensive. They have quite a few nice gathering rooms where they can watch TV and things like that outside of their rooms, so they can go out and mingle. I visited Arbor Terrace of Lanham. It had a smaller space and a more compact feel. However, I didn't like that it was in a major street, and the layout was confusing for me. Arbor Terrace of Lanham was good and nice. I liked the services that they provided. It was very convenient, and they had good customer service. The community was great. The rooms were very neat, organized, and clean. They're a bit small but pretty spacious. They showed us a calendar of the daily plan they would have with their residents. Arbor Terrace of Lanham was absolutely wonderful. It was our first choice for my mom. The staff members were very accommodating and very nice. The dining set-up was wonderful as a restaurant. They actually have two dining rooms. One for those who were able to get around on their own and another for those who needed some type of help in terms of wheelchair. It was very nice. Arbor Terrace has definite potential and different levels of care that my grandmother can buy into. The staff was very pleasant, approachable, and willing to answer our questions. It was well kept and easy to get to. I saw a well-kept model room. My relative is at Arbor Terrace. The room, the apartment, dining, social interaction activities, and amenities were all ideal and best for my cousin’s needs because she has slight dementia. Everything was pristine; the greeters were more than helpful and well-informed. It was a bright and cheery area. They had a number of floor plans from which to choose, and we also got a promotion for the first year on her room a deduction. It was accessible to our family as our family lives in the area. Arbor Terrace of Lanham was very nice. They really needed to put the cost upfront. The literature said it was around $4,000 a month. When I got the paperwork, it was going to be more like $6,000 a month. However, their dining facility was nice. They had a chef, and the food was delicious. I was the most impressed with Arbor Terrace. This was the highest appraisal I had of all that I went to. The special care unit was extremely clean. I liked everything at Arbor Terrace, from the amenities to the rooms to even the reasonable price. Overall, it was a nice facility. From what I've seen, the facility is clean. Arbor Terrace of Lanham was a wonderful place. They had a beautiful courtyard and a garden in which some residents help tend and grew all kinds of herbs and flowers. Indoors, it's a large facility. People were coming in the day we were there to do a sing-along. It was Christmastime, and they gave us some baked cookies. It was beautiful, like a six-star hotel. The chef took us on a tour, and it was a good experience. I talked to some residents who were there for seven or eight years, and they really loved it. The staff was friendly, accommodating, and compassionate, and they knew the residents very well. Arbor Terrace was beautiful, but that was too far from me. When we walked in it was quiet, and I liked the setup with the birds. It was sanctuary-like, and very therapeutic. They had a separate place for memory care. The rooms were very nice, clean, and spacious. The staff was accommodating. Arbor Terrace was beautiful, very modern, and had great security. However, the place was huge and would definitely be confusing to navigate for my mother. I like their dining room, though, because it was restaurant-type dining. I went there on a Sunday, so people were preparing for worship, and it was kind of busy. I felt like the residents were thriving pretty well there. Overall, the facility was beautiful. The room was very nice, but the facility was just too big. Arbor Terrace was pretty good, but the prices were very high. We liked the rooms. I would recommend them from what I saw. They had religious services, a beauty salon, and meals in the dining area. The dementia area was separate from the other living area to give dignity to those individuals. Arbor Terrace has a beautiful layout and nice living conditions with a very homey atmosphere. The people were extremely helpful and gave full explanations on the accommodations and pricing. The facility offerings created an all-inclusive living style for the residents. They don’t have to go anywhere because they have everything right there. They have a reading room, a theater room, a salon, and a lot of activities. They also have different celebrations for all holidays, too. Arbor Terrace staff were very pleasant. They greeted me at the door and everybody was very pleasant. They took their time with me and answered all of my questions. A staff member introduced me to a couple of the residents, which I thought was pretty good because you could get a hands-on view of how the residents like the place. Everybody was very good. The rooms are big, hotel-like rooms. I have both of my parents, but the cost is double the price, double the extra charge, double everything. Instead of one and a half times, it’s a full double. In my mind, the add-on should only be half as much, not twice as much, but that’s not how it works. Their rooms were not big enough for two people. The dining area is good because it’s like being in a restaurant. The activity rooms look like they have an abundance of activities going on there. The neighborhood surrounding Arbor Terrace is scary. If one of my parents wandered off, I would be in fear for their life because it’s an older community. I wouldn’t go there after dark, that’s for sure. I have no one that I would recommend it to in my circle of friends. I would recommend this place to other people. I visited Arbor Terrace for my grandmother. I like it a lot. It had a very nice, active atmosphere. Their rooms were varying in sizes. They have one-bedroom, two-bedroom, and efficiency, and they all looked very nice. The staff that I met seemed to be nice. Arbor Terrance is clean, and the nurses are very good. My sister seems happy there. They rooms have a room and bathroom. They have three meals a day, and she is satisfied with the food. They have physical therapy, exercise, bingo, and memory games. We found a place for my mother. She is in Arbor Terrace in Lanham, Maryland. We've had some significant issues that we are hoping are addressed over the next week or couple of weeks. My mother has been there for about a month now, but there have been some significant issues with the management of the front door, safety concerns, as well as concerns with protocols and procedures for new residents. My mother is 90 years old and is trying to transition, and so issues with engaging her and helping her through this transition, we have found to be lacking. Everyone is very nice, very welcoming, and I don't have any concerns with people; the staff has bee very friendly and welcoming. It is just that they don't seem to be trained or to follow protocols that are in place. The facility is beautiful. It is very well-maintained, and it is a very nice facility. The food is very good. It is very well-maintained and very clean. I have visited what is now known as Arbor Terrace. The staff is quite accommodating and nice. The facility is nice, clean, and well kept. I talked to some of the residents, and they seem to like it. I thought that community is one of the better communities that I have visited and would like to put my mother into. They have an in-house movie theater. They have bingo, shopping, and movie night popcorn. I didn't get the whole list, but I think they have a number of things, and it is nice. It seems safe but the only concern I will have is it would be great if they have a security person. At night the nurses open the door, and if the wrong person comes to the door they wouldn't know if that is a family member or not. If that person comes in and wants to be destructive, there is nobody to help them. The look of it, the cleanliness of it and the flow of it impressed me. It is a very nice, appealing, and pleasing place. The studio that she was going to be in looks nice, and it is OK. The way they had the dining room set up is very nice. Arbor Terrace Senior Living was chosen because it was close to my uncle's family and friends so they could visit him frequently. The staff is excellent. The rooms are very nice and very pleasant. There is lot of natural light coming in from the windows. I have tried eating here several times, and it is very good. The menu changes daily, and if you want something that's not on the menu, they'll be glad to prepare it for you. You just tell them what you'd like to have, and more than often they are able to accommodate you with whatever food item you are interested in eating. They did discuss with me the activities they have, but my uncle doesn't participate in any activities. It is very modern and very open. The staff is very good with what they do. I'm in constant contact with various people in management there. I just find it good for my uncle because he is not able to walk very much. He got a nursing staff right next to him, and they are very accommodating to him. I would recommend this facility to others. I would check in there myself in a heartbeat. We had many other options, but we wanted to keep it in his backyard. Once we saw this facility, we knew that this is exactly where he needed to be. I like that the community didn't have a lot of people. It seems great. The residents seem to be happy to be there, and the people who work there seem happy to work there. The room is spacious. They have two full bathrooms and another room that they can use as an office with a computer and television. Then, they have a living room, a dinette, and a bedroom. They have a beautiful movie theater. They have an aviary where they have beautiful birds. They have a huge party room, an activity center, a beauty parlor, and a spa. This is a great setup for my parent who shares a two bedroom, two bath apartment with another resident. That are a perfect match for each other. The community offers lots of activities to keep the residents engaged. The food is good. The building is nicely decorated and well lit. There's room for improvement in the overall cleanliness; the wood floors need cleaning and the common bathrooms never seem sterile. We have decided on this community for my mother. What I like best about it is that they seem to have pretty good nursing staff. They seem to be knowledgeable and somewhat attentive. My mother wears this little alert buzzer; however, when she calls them, they may not come exactly as soon as she likes. However, she enjoys the food there. Also, this community is convenient to where I live, so it is easy for me to visit my mother there. The room is pretty basic. She has a shared room, where another lady shares the bathroom and the common area. They have various activities, like movies and bingo. They have trips to the mall, but as far as to the doctor, I take care of that. The community looks nice. The staff is very friendly, they have a lot of activities going on there, and they take good care of them. It would be nice if they could fix the WIFI because it's something that my dad is interested in and enjoy. At Arbor Terrace, we're dedicated to making assisted Living the best possible care option for both you and your loved one. Our ongoing commitment to excellence is based on our service vision. As a community of caregivers, we are here for one purpose: to engage and enrich the health and spirit of our residents. We honor individuality and celebrate each person's unique life through deep connections with our residents and families. We create delightful surprises and meaningful moments within a safe and caring community. We listen. We respond. We care. What should caregivers and potential residents know about Arbor Terrace Senior Living?